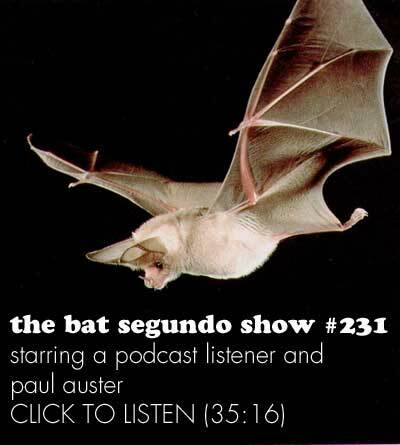 Paul Auster appeared on The Bat Segundo Show #231. Auster is most recently the author of Man in the Dark. Condition of Mr. Segundo: Opening himself up to explanation. Correspondent: I wanted to ask you about something that I’ve long been interested in your books, and that is your concern for specific dollar amounts. Again, it plays up here in the Pulaski Diner, where everything is five dollars. And I also think about the scenario with M.R. Chang in Oracle Night, in which there’s the whole situation between the ten dollar notebook and the ten thousand dollar notebook. Correspondent: And again it becomes completely, ridiculously violent. But there is something about the propinquity of the dollar amount that you keep coming back to in your work. What is it about money? And what is it about a specific figure like this? Auster: It’s funny. I never, never thought about that. Wow. Well, listen, money’s important. Everyone cares about money. And when you don’t have money, money becomes the overriding obsession of your life. I wrote a whole book about that. Auster: Hand to Mouth. And the only good thing about making money is that you don’t have to think about money. It’s the only value. Because if you don’t have it, you’re crushed. And for a long period in my life, I was crushed. And so maybe this is a reflection of those tough years. I don’t know. I don’t know. Correspondent: Or maybe there is something absurd about a specific dollar amount or something. I mean, certainly, when I go to a store and I see that something is set at a particular dollar amount or it fluctuates, it becomes a rather ridiculous scenario. Because all you want to do is get that particular object. Auster: Yes, yes, yes. But often in my books, people don’t have a lot of money in their pockets. So they have to budget themselves carefully. Correspondent: Well, not always. You tend to have characters like, for example in The Brooklyn Follies, people who have a good windfall to fall back on and who also offer frequently to help pay for things, and their efforts are often rejected out of pride by your supporting characters. And so again, money is this interesting concern. But I’m wondering why you’ve held on to this notion. It’s now thirty years since the events depicted in Hand to Mouth. I mean, is this something you just haven’t forgotten about? Correspondent: Do you still pinch pennies to this day? Auster: No, no, no. Not at all. No, I’m not a tightwad at all. Auster: I’m generous. I give good tips. It’s just — the way I live my life, ironically enough, is: I don’t want anything. I’m not a consumer. I don’t crave objects. I don’t have a car. We don’t have a country house. We don’t have a boat. We don’t have anything that lots of people have. And I’m not interested. I barely can go shopping for clothes. I find it difficult to walk into stores. The whole thing bores me so much. I guess the only thing that I spend money on is cigars and food and alcohol. Those are the main expenses. Auster: No. Because our library in the house is so bursting, we have no more room. We have things on the floor. And books come into the house at the rate of — you see, three came today for example. I’m pointing to them on the table. So we’re just inundated with books. 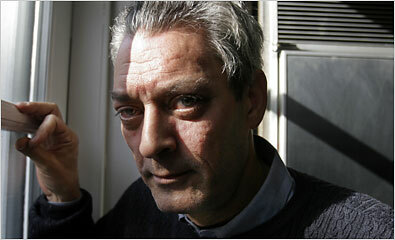 I wasn’t able to make it, but thankfully Tito Perez has offered a report of last night’s Paul Auster appearance.